It's National Almond Day! 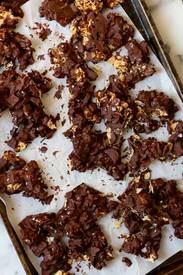 This combination of dark chocolate, toasted almonds, and candied ginger makes for an incredibly delicious, mega simple, way decadent gifting treat… or you can personally hoard it for your own cookie jar. Both make good sense.